Music magazines are getting hit with a double whammy in the age of digital media. Like all print publications, their audience is going online—but so is the music. Why read about a new album when you can just listen to it on Spotify? Spin magazine is responding by shifting its focus online in a big way with a major redesign that literally puts the music first with a music player right at the top. In the video above, digital general manager Jeff Rogers gives us an exclusive preview of the new site, which launches tomorrow (the music-streaming player launches in early March). It is part of a sweeping redesign of both the print magazine and website. The print magazine is larger, back to the original size of Spin, with a mix of heavy stock and glossy paper. It will only come out bi-monthly instead of monthly and become more of a high-end collector’s item for music aficionados. The homepage is divided into sections. As you scroll down, the background color and layout changes. The top is news, interviews, and profiles, with a black background. Then below that are the music reviews: essentials, classic, and “worst music.” There will also be a whole new set of blogs to keep the stories fresh. The new Spin site is filled with thousands of reviews—both long form and 140-character Twitter reviews. The print magazine will no longer carry reviews. They have all been moved online. “Getting your reviews in a magazine is like getting your stock quotes in a newspaper,” says Rogers. The new site takes some of its design cues from Spin Play, the magazine’s iPad app that came out last year. Every article has full tracks that you can listen to while you are reading, and even as you browse around the site, the music keeps playing in the player which takes up the top nav bar. Clicking on the player while you are listening to a song gives you more songs and articles about the artist, and the ability to buy the song through iTunes or Amazon. There will also be a Spin 30—which are 30 songs the Spin staff thinks you have to listen to now, and other Spin Lists. Hit play at the top and you get the current playlist. Spin is offering full tracks, but only a few hundred at any given time. It is not trying to compete with streaming music services like Spotify, rather it is doing what magazines do best: offering an edited selection of articles and related music. (In the future, it plans to export its playlists to other music services like Spotify). The majority of songs are promotional tracks which will exist on the site for a limited time, but Spin will license tracks as well. 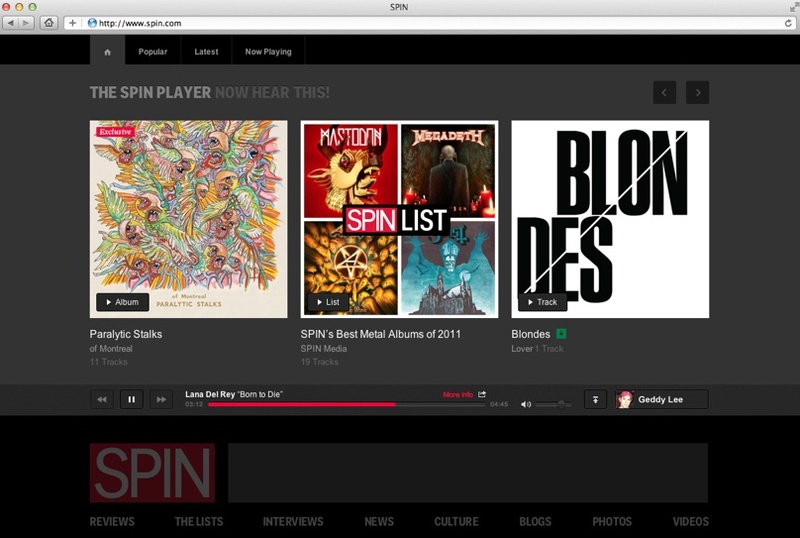 Spin is finally treating its website like a product instead of just another music news site. It will be a place to go to not just to learn about music, but to experience it.